Death caught up with a man who brought to Cleveland an era so violent it is now almost unimaginable. Before Harley-Davidson motorcycles and riding leathers became accoutrements of affluent suburbanites in mid-life crisis, they were symbols of terror because of men like Nelson Blackburn. He was a Hells Angel. The Scottish-immigrant — known as “Scotty” or “The Scotsman” — was a man to be respected and feared. He shed his accent, grew a moustache that wrapped around the corners of his mouth and carried himself larger than his five-foot-ten, 165-pound frame. He died Oct. 27 at University Hospitals. At 67, he was beaten not by prison time, not by lawmen, or by rivals who once wanted to kill him, but by old injuries, rheumatoid arthritis, the ailments of age and a life hard lived. Blackburn is among those responsible for bringing Northeast Ohio a time when the actions of out-of-control motorcycle gangs make the plot of the current fictional cable TV series “Sons of Anarchy” seem plausible. In Cleveland, the era began in December 1967, when Blackburn and others formed the Cleveland chapter of the Hells Angels. Within two months, two innocents were dead. Blackburn was born Oct. 8, 1944, and moved to the U.S. before turning 16. By his early 20s, he was a member of the Gooses, a motorcycle gang that would in retrospect seem like choirboys. Then, in 1966, Hunter S. Thompson‘s book “Hells Angels: The Strange and Terrible Saga of the Outlaw Motorcycle Gangs” made the West Coast gang the nation’s most notorious. Members have long insisted they are a peaceful club that has happened to have more than its share of law breakers. But law enforcement officials are adamant the group was and remains a violent criminal organization. In December 1967, the Angels’ leader, Ralph “Sonny” Barger, visited Ohio, and Blackburn’s Gooses joined forces with another gang, called the Animals, to form the local chapter of the Angels, according to newspaper stories and law enforcement officers. War was almost immediately declared on the gang claiming control of the area at the time, God’s Children. The war is recorded in newspaper clippings and in the memories of law enforcement officers. So are many incidents that happened since. Armed members from each side began hunting each other unsuccessfully. Nelson “Scotty” Blackburn was known for being strong, touch and fearless. He was proud to have been an Iron Worker, playing a role in the construction of the Rock and Roll Hall of Fame, the Key Tower, Jacob’s Field and other buildings throughout Northeast Ohio. On Feb. 28, 1968, Blackburn and about a dozen Angels were shooting pool and drinking at Barto’s Cafe, a bar on the East Side of Cleveland. They wore their jackets emblazoned with the Angels “colors.” Some wore swastikas. Having once again found no God’s Children to tangle with, an Angel hit a black man. Other Angels joined in the beating, and the gang members ultimately killed two men, one black, one white –Roosevelt Brown and James Tillet, both 38, newspaper stories said. Angels fled the state in two groups. After nearly two weeks on the lam, Blackburn, two other Angels and one of their girlfriends were caught in New York. The next day, the others were captured in California. A woman testified at Blackburn’s trial that she saw him fire one shot. She said she wasn’t sure whether it hit anyone. Although Blackburn testified that he didn’t see any guns that night, the jury found him guilty of second-degree murder. The judge sentenced him to 10 years to life. Three other Angels also were convicted on murder charges and given life sentences. Four more were convicted of lesser crimes. In 1975, Gov. James A. Rhodes took the recommendation of the state parole board and shaved four years off Blackburn’s sentence and three off another Angel. Within weeks, Blackburn was home and still an Angel. While he was away, the differences between motorcycle gangs had escalated to full-scale battles. In one, on March 6, 1970, Angels and members of a gang called the Breed fought with knives at a motorcycle show in Cleveland, newspaper reports said. Nearly 30 men were stabbed or cut. One Angel and four of the Breed were killed. Prosecutors charged 57 men. Fourteen Angels would plead guilty to manslaughter. Their clubhouse was — and still is — an old funeral home on Edna Road in Cleveland’s St. Clair-Superior neighborhood. It was near there that, in 1976, Blackburn met his future wife. She was 16. Two years later, they had a daughter, Rachael; then a son, Kenny, in 1981. Blackburn also had a daughter, Kimberly, from a previous marriage. He proposed to Lisa each December for five years. Finally, Lisa, who thought marriage silly, agreed to tie the knot in 1983 “for tax purposes,” she said last week. The Blackburns married at the Angels’ clubhouse in front of their children and his fellow bikers, Lisa said. The date was the anniversary of the chapter’s founding. She wore a dress borrowed from a babysitter. He wore his Angels’ jacket. After the celebration, they went home and watched Johnny Carson. On the rides they took with Angels, the couple visited each coast, but never saw an ocean. There were other places to go, Angels to see. By day, Blackburn was an iron worker. He helped build Jacobs Field, the Key Tower and the Rock and Roll Hall of Fame. He moved his family to Ashtabula County in 1986. Still, he remained an Angel. Lisa Blackburn looks with grief at photos (not shown) of her husband. Nelson “Scotty” Blackburn died Oct. 27. He had gone to hospital for a kidney stone, only to learn his lungs were failing. By this time, the Angels’ had branched out from barbarism to more lucrative crimes, law enforcement officials said. In 1985, Cuyahoga County Common Pleas Judge James McGettrick accepted a bribe of $5,000 or more to fix murder cases against two Angels. The judge was convicted of the crime and sentenced to four years in prison. Crimes by Angels continue to make news. Most recently, a Medina County jury convicted Scott Stage, 46, of Parma, on a charge of felonious assault against a biker in Montville Township. Although it sounds less violent than the past, law enforcement officials say the gang has not weakened or gone soft. They have merely gotten smarter. “There’s no profit with being involved in street violence and being in court all the time,” said an official who spoke on the condition of anonymity. He and others said the Angels are as powerful than ever, with members having their hands in union contracts, drug trafficking, prostitution and protection, sometimes partnering with other branches of organized crime. One law enforcement officer said he was upset the Angels’ role was not included in a recent movie about Irish mobster Danny Greene. The Plain Dealer unsuccessfully tried to reach Angels who rode with Blackburn. Some are dead. Family members said Blackburn quit the Angels in 1993, sold his motorcycle and embraced a new life. 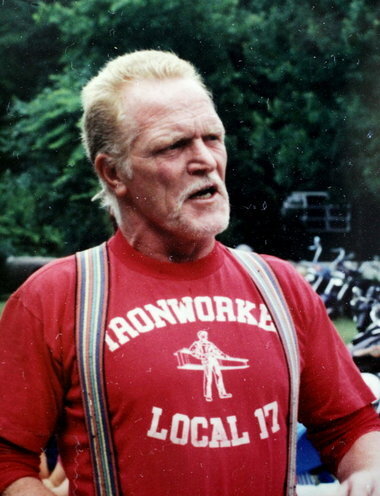 His iron worker days ended when he broke his leg in 1998. Each morning for the last few years, he said a silent prayer before the picture of the Sacred Heart of Jesus on his nightstand, his wife said. She and his children want him remembered not as a Hells Angel, but as husband, father, grandfather of five, iron worker, member of the Fraternal Order of the Eagles. Kenny Blackburn said he stayed home with his father as his health worsened.